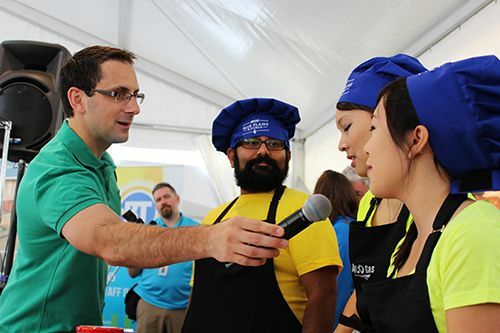 As I had mentioned in an earlier Manicure Monday post, I recently participated in a cooking contest at this year's Taste of Edmonton festival. 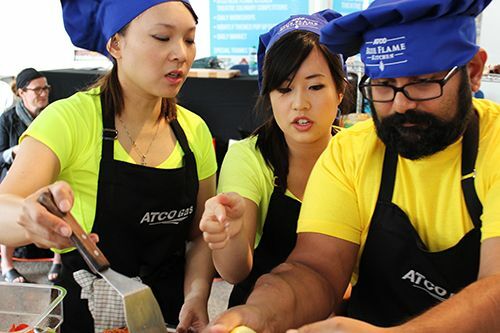 A few months back, the organizers for Taste of Edmonton sent out a message about their Black Box Challenge, similar to 'Chopped' on the Food Network where you're given a box of 5-6 ingredients, and your challenge is to make a dish to showcase all the ingredients together. Fun, right? Well, not so much when you're a food blogger like me who reviews restaurants and hardly cooks at home! Just kidding. I was pretty intrigued by the contest, and instantly found myself on a team with my friends Lesley and Addie. We would be facing two other teams of three participants, and we weren't sure whether to be excited or nervous heading up to the day of the competition. We knew who the competition was, and saw that they had done a lot of practicing, and seemed pretty confident in their skills, determined to win the challenge. Us on the other hand? Our schedules were so hectic that we hardly had any chances to get together and have a sense of what our team would be like until two days before the challenge, where we had the opportunity to cook a dish together. At least we were given the hint that the items in the box would be focused on local products and current food trends. Fingers crossed and relatively confident, we showed up on Sunday morning ready to cook! 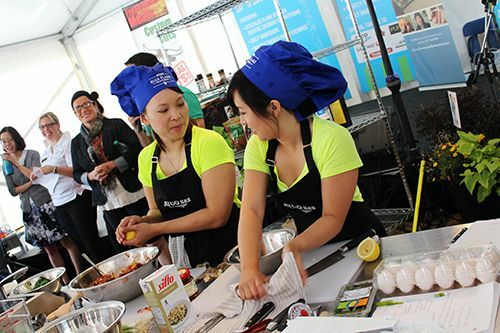 Once all the teams were settled in and the judges took their seats, the mystery ingredients were revealed to us: gochujang sauce, duck fat, eggs, potatoes, kale, and yak. When I heard that yak was in the basket, I'm not going to lie, my heart rate increased a bit! My initial thoughts: "Aren't those the animals that help people climb Mount Everest? What are they doing in Alberta?" But I was confident in our team and knew we would be able to pull something off. One of the emcee's, Courtney Theriault, came over to talk to us to ask about our strategy. And to tell you the truth, we didn't have a strategy except to work off of each other's strengths. Lesley is great with proteins, Addie is an expert on starches and marinades, whereas I like to think I have a good handle on making salads and plating dishes. We walked in as the E-lemon-ators in our yellow shirts, ready to take on and take out the competition! What we wanted to do was keep it simple. How could we put a dish together using the six ingredients, highlighting each one on its own, but have them combine cohesively as a unit? And it struck us instantly. We were going to do our own version of a poutine. We marinated the yak in a mix of gochujang sauce, fresh lemon juice and diced onions, searing and cooking it in a pan until medium rare. With the potatoes, we sliced them up and deep fried them into fries using the duck fat, topping them with crisped up kale and parmesan cheese slices from the on-site pantry. 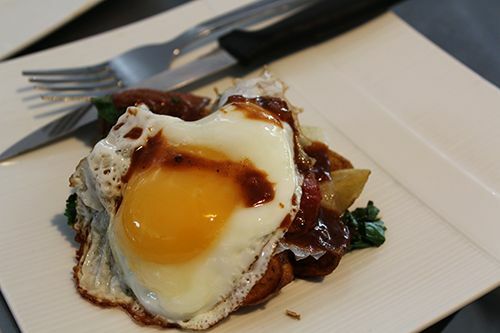 After slicing up the yak, we plated it on top of the potatoes, topping it all off with a sunny egg. The finishing touch? We deglazed the pan used to cook the yak to make our version of a quick gravy to drizzle on top. Mmmm. Having only one hour to prep and put our dish together was definitely stressful in the heat of the moment, but looking back on the experience, I don't regret it and would compete with my two teammates again in a heartbeat! Although we didn't bring home the prize (rumour has it we came in second by 1 point!) the experience itself was worth it for me. So all I have left to say is THANK YOU to everyone that came out to support my team on the day of the competition. I was honestly shocked by the number of people that came to the event just to cheer our team on, and I will never forget the day. 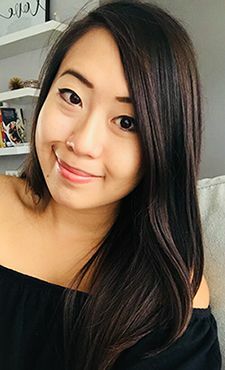 Your support means the world to me (and my team!) and I appreciate each and every one of you that took time out of your day to stop by the event. 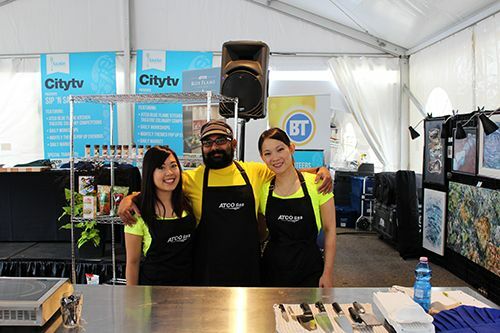 Thanks to the team at Taste of Edmonton for putting together and hosting the competition, and to all the sponsors that made the event possible. If given the opportunity.. you'll see me again next year with Lesley and Addie fighting for the title! What an awesome experience Andrea! The dish came out beautiful and I know it was delicious. Your team did a great job! You looked so glamorous while doing it too. Great photos! Glad you had fun. I have been waiting for this post! Your dish looks so good! Totally restaurant worthy! I would eat it for sure!